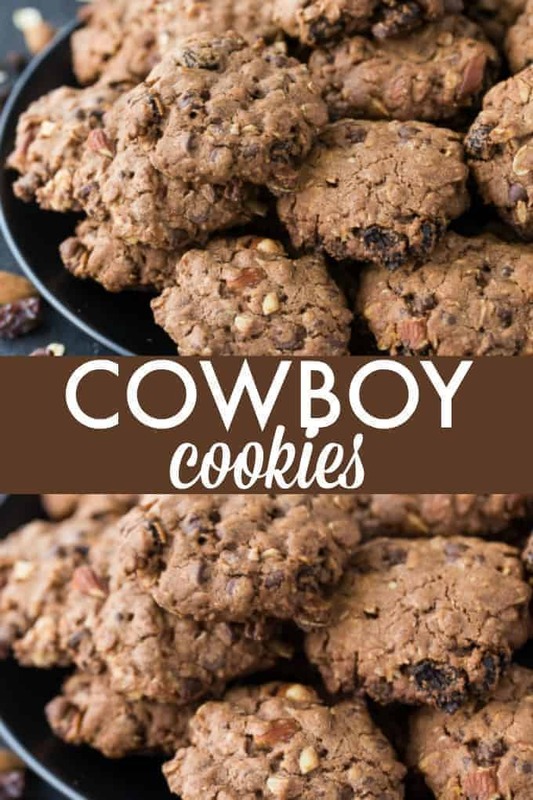 I’m not sure of the origin of Cowboy Cookies and you’ll find a variety of versions of them if you look online. To me, they mean a cookie that’s packed full of good stuff like a cowboy is. 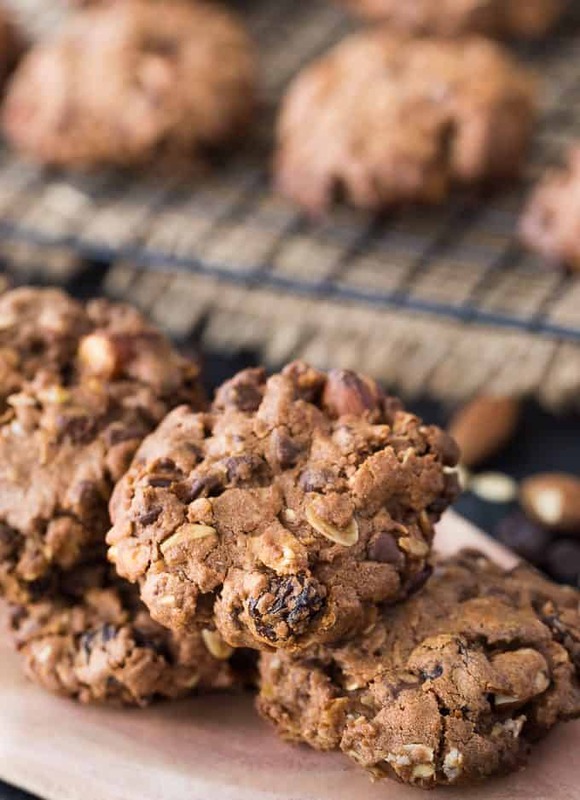 This recipe has a lot going on with chocolate chips, oats, raisins and almonds. It makes one delicious cookie! Feel free to tweak it and add your own spin to it. Don’t like raisins? Try dried cranberries or leave them out. Chocolate chips not your thing? Add some white chocolate chips or butterscotch chocolate chips. You get the idea. Just make sure you pack them full of your favourite ingredients! I can tell you that this batch of Cowboy Cookies did not last long. It makes three dozen cookies so I spread the love by giving some to my cousin to take home to her family. She has two teen boys with insatiable appetites. My recipes get gobbled up way faster at her place than mine. I have picky eaters here. However, my girls both liked this recipe and even Olivia’s boyfriend had a few. 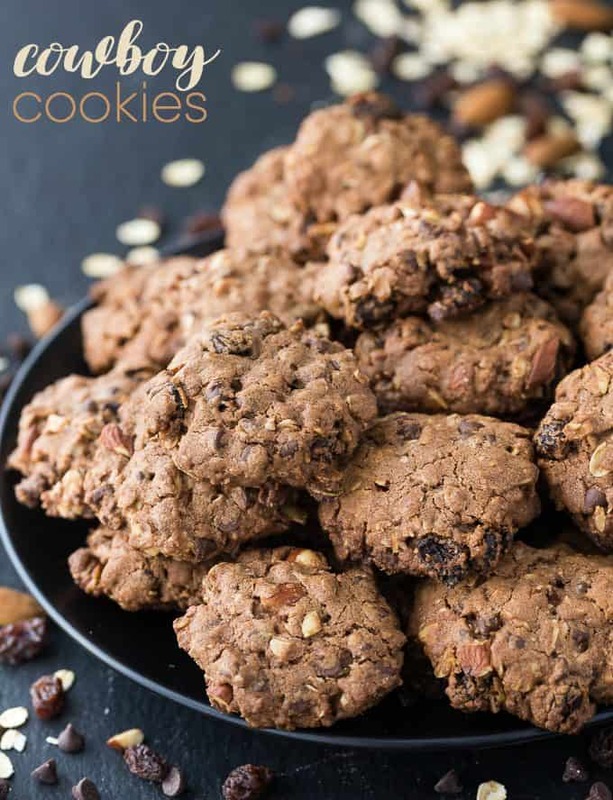 If you like rich and chewy cookies, you’ll love this recipe! Whip up a batch and surprise your kids with a yummy after school snack! Unfortunately, they can’t go to school because of the nuts. If you want a school snack, just leave that ingredient out. 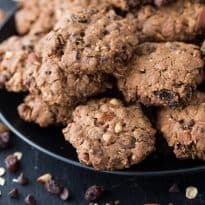 Have you ever made Cowboy Cookies? I’d love to hear about your recipe. A rich, chewy cookie packed full of good stuff! 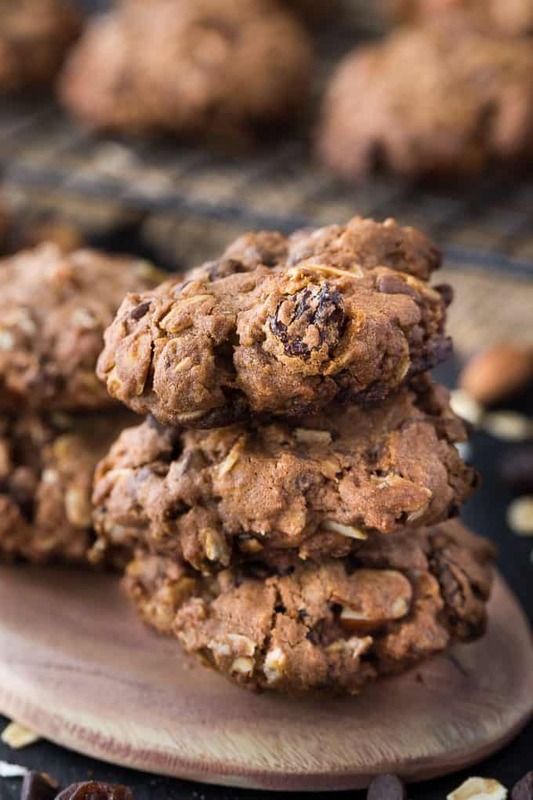 This cookie recipe is made with oats, chocolate chips, almonds and raisins. Preheat oven to 375F. Grease a baking sheet with cooking spray and set aside. Beat butter and sugar on low speed until combined. Add in egg and vanilla. Beat on low speed for about 4 to 5 minutes. In another bowl, stir together flour, cocoa powder, baking powder, baking soda and salt. Add to butter/sugar mixture and stir to combine. 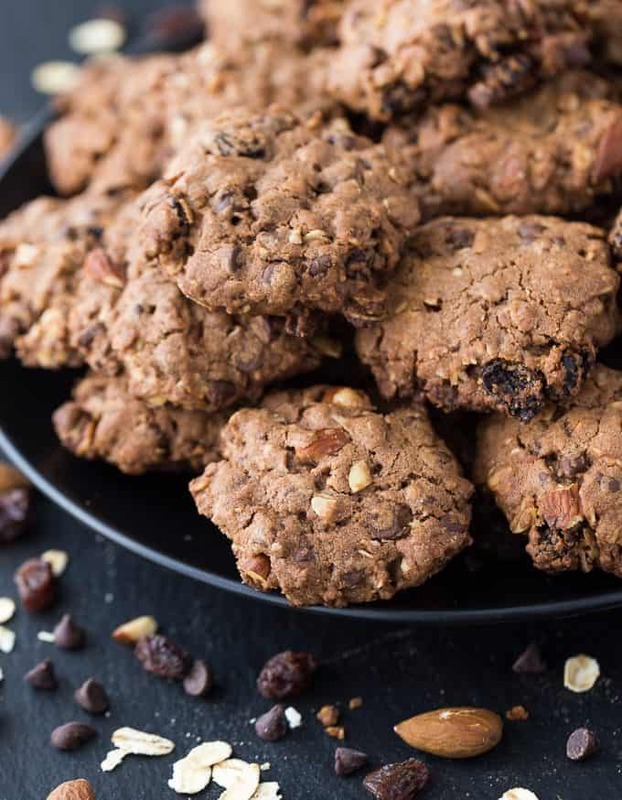 Stir in oats, chocolate chips, raisins and almonds. Drop about a tablespoonful on the baking sheet. Bake for 13 minutes or until lightly brown around the edges. Cool on a wire rack before eating. They sound like that recipe for Kitchen Sink cookies which are also delicious. These cookies look and sound really good. I love all of the ingredients. Thank you for the recipe. These cookie sound delicious! Do you think walnuts would work instead of almonds? These cookies sound so delicious! I’ve been craving a good cookie! I just might try this recipe this weekend. They look like Hermit cookie which are my favorite, your recipe’s keep me busy and there is not one we have not liked, thanks for sharing! I love your Cowboy Cookies recipe and want to make these fun cookies. I have never had these cookies before and they look so delicious. Thanks for sharing another awesome giveaway! Now these look like my kind of cookie–so yummy! I’ll take 20! 🙂 YUM! Yummy. These looks great. Thanks for sharing with us all. I don’t think I’ve seen cowboy cookies before, but they look delicious! I’ve been missing out! These are yummy Cowboy Cookies, love the chocolate! Hope you have a great week and thanks so much for sharing with Full Plate Thursday. Yum, yum, give me some! These cookies look delicious! I love your description of why they are called “cowboy” cookies. You’ll be one of the features at tomorrow night’s Creative Ways Link Party! Thanks so much for sharing with us! I’m salivating! Yummers!! Definitely pinning this one for my ‘cowboys’! Thanks for sharing. This recipe looks easy to make and the cookies look very tasty. Another one to add to my files. The first thing I did after reading this recipe is to save it. I know that this will be a favorite with the grandkids and my husband. Thank you so much for this recipe.